Living as he does in Seaside Park, New Jersey, a small town on a slim barrier island with Barnegat Bay on one side and the Atlantic Ocean on the other, it’s no surprise that Bob Popovics is a die-hard saltwater fly-fisher. He specializes in casting from the surf for striped bass, bluefish, and false albacore as they prowl the ocean’s edge, ever in search of prey. Popovics popularized the use of epoxy to give baitfish and shrimp patterns slim, glossy and durable bodies, and silicone to create flies that were light, translucent and flexible. His Hollow Fleye concept made it possible to produce very large flies that could still be cast easily with a fly rod. His patterns are well within the capabilities of the average fly-tyer, and have been adopted and adapted by streamer fly anglers for use in countless saltwater and freshwater applications. Popovics has been called one of the great ambassadors of fly-fishing for his eagerness to share his knowledge with fellow anglers. This spirit was embodied in the open houses at his home on the Jersey shore, which played a role in the coming explosion of public interest in saltwater fly-fishing. Between 1986 and 1992, on Tuesday nights from January to May, Popovics opened his home to all who shared his passion for fly-fishing the surf to talk strategies and streamers in an atmosphere of camaraderie. Most were local anglers, but visitors from Maine to Maryland, Michigan to Pennsylvania travelled to attend. Among them were some of the biggest names in fly-fishing. Today, Popovics is consistently one of the most popular presenters on the fly-fishing show circuit, and he continues his quest for ever more effective fly designs. He was inducted into the Freshwater Fishing Hall of Fame in 1998, and sits on the advisory boards of many of the top names in the fly-fishing tackle industry. Popovics credits the enthusiastic support of the late Poul Jorgensen for giving the young fly-tyer a much-needed boost of confidence early in his career. The two men were good friends until Jorgensen’s passing in 2004. As the editor of The Fishing Gazette in London from 1878 through 1927, R.B. Marston published the insights, experiences and expertise of the leading anglers of the day, chronicling such developments as the rise of the dry fly in Great Britain and the United States. His journalism was vastly influential. During his lifetime, he was regarded as one of the most important scholars in the world of fly-fishing, and certainly the most authoritative on the literature connected with Izaak Walton and The Compleat Angler. Robert Bright Marston once said he had been born a lover of fishing. The schoolteacher who caught Marston reading The Compleat Angler in class must have thought so as well, though as an angler himself, he went easy on the lad. As Marston’s education progressed, so did his angling experiences, as he fished his way through England, Scotland, Ireland and Germany. In 1884, Marston founded The Flyfisher’s Club in London, and in 1912, launched its biannual publication, the Flyfisher’s Journal. Also in 1884, Marston was involved in one of the earliest efforts to introduce brown trout to American waters; he made a gift of 10,000 eggs of Salmo trutta to the newly opened Cold Spring Harbor Hatchery in New York. In 1890, Marston began publishing letters from a young American angler named Theodore Gordon. Gordon’s eloquent but plainspoken observations on the nature of trout fishing, especially dry-fly fishing, on American waters would grace the pages of the Gazette until his death in 1915. Historian Gordon M. Wickstrom reports that his writing in the Gazette made Gordon more famous in England than in his own country during his lifetime. By publishing Gordon for a quarter-century, Marston kept the world appraised of the uniquely American style of fly-fishing coming into existence on the rivers of the Catskills. Paul Schullery, fly-fishing’s preeminent historian, has been a pioneer of the study of the cultural foundations of our sport and the values upon which it depends. As a lifelong professional conservationist, he has effectively championed the scientific management of a host of natural resources, all of which relate to the protection of the fly fisher’s world. As a writer he has published path-breaking literary and scholarly explorations of the richness of the fly-fishing experience. Schullery began his career in history, conservation, and fly fishing as a ranger-naturalist in Yellowstone National Park. From 1977 to 1982, he served as the first executive director of the American Museum of Fly Fishing in Manchester, Vermont, and was the editor of the museum’s quarterly magazine, The American Fly Fisher, from 1978 to 1983. Schullery went on to write eight books on the history, culture, lore, and natural history of fly fishing, and co-wrote several others. He has published in dozens of magazines and technical journals, ranging from The New York Times to BioScience to Outdoor Life, and including most of the fly-fishing magazines. He has been regularly honored as an influential writer and thinker on natural resource management and national parks, and has served on many advisory boards for conservation and educational groups. Schullery is the author, co-author, or editor of more than a dozen books about Yellowstone National Park. He has been the recipient of a number of prestigious literary and professional awards, including honorary doctorates from Montana State University and Ohio University; the Wallace Stegner Award from the University of Colorado Center of the American West; and the Roderick Haig-Brown Award from the Federation of Fly Fishers. He has spoken on conservation issues in the national media, including the Today Show, PBS, World Monitor News, the History Channel, NPR, and others. He wrote and narrated the award-winning 2002 PBS/ABC feature film, Yellowstone: America’s Sacred Wilderness. He served on the advisory board for the Ken Burns 2009 PBS series The National Parks: America’s Best Idea, and appeared frequently in the film. Since 2009, he has served as Scholar in Residence at the Montana State University Library in Bozeman, Montana. No person is more closely associated with streamer fly-fishing than Joseph D. Bates, Jr. Between 1950 and 1986, Bates established himself as one of the world’s leading authorities on tying streamers and using them to catch everything from Atlantic salmon to striped bass. A native of West Springfield, Massachusetts, Bates graduated from Massachusetts Institute of Technology in 1926. During World War II, he served on the staff of Gen. Douglas MacArthur in Australia, New Guinea and the Philippines, and was awarded the Philippine Liberation Medal with three battle stars. After the war, he remained an officer in the Army Reserve, from which retired at the rank of Lieutenant Colonel in 1968. But when he was released from active duty, Bates went back to work in his father’s advertising firm, which had been contracted to publicize the spinning tackle recently introduced to the American market. Joe Bates’s books, including Streamer Fly Tying and Fishing, Atlantic Salmon Flies and Fishing, The Art of the Atlantic Salmon Fly, and Streamers and Bucktails: The Big Fish Flies, constitute one of the beloved bodies of work in the literature of fly-fishing. They have informed, instructed and inspired generations of anglers. A.J. Campbell grew up fishing trout streams in Vermont and New Hampshire. After a stint in the U.S. Navy, he settled in Maine and began his writing career. He was first published internationally in 1978. In 1981, A.J. became a Department Editor for Salt Water Sportsman and remained with the magazine for 25 years. He was Rod Editor for Fishing Collectibles Magazine and Salt Water Editor of The Maine Sportsman. Through the years, Campbell has been a USCG licensed captain and a Registered Maine Guide. In 1996, he wrote Successful Shark Fishing which included a pioneering chapter on fly tactics. Campbell started collecting antique fishing tackle in 1968. In the mid-1970s, he began taking notes for a collector's book on fly rods and reels. The research project culminated as Classic & Antique Fly Fishing Tackle, published in 1997 with a second (softcover) printing in 2002. Presently, A.J. is working on a new illustrated book, The Isaak Walton: Fred Thomas & His Trade Rods. He is a well-respected authority in the fly fishing community. A.J. fished internationally for three decades, angling in 20 countries. He became known and recognized as a world-class angler, establishing an IGFA World Records as the first person to take a salt water record on a 2-lb test tippet. He also ranks among the few anglers to catch and release a fly-caught wahoo, a giant blue-fin on stand-up tackle, and a dry-fly blue shark. Today, he fly-casts for native Maine trout from his wooden canoe. In addition to A.J. 's recognition as an authority on collectible fly tackle and its history, his other interests include researching the history of steppe tribes of Central Asia. He is also is a living history re-enactor and a Certified Instructor in traditional steppe archery. His writings include two ancient-era novels, The Demon's Door Bolt (humorous sci-fi) and Forging the Blade (historical-mystical). A.J. also designs archaeologically based reproductions of Sarmatian arms and armor. In the late 1970’s Paul could be found collecting aquatic insects along any Catskill stream, or off the grills of cars in parking lots or from storefront windows. One of these creatures, dead or alive, provided him with an actual entomological study so he could create a model in feathers and furs on a hook. By the 1980s, Paul Schmookler had become an authority in the angling world with his collection of vintage fly tying materials, creative fly tying skills and library of 19th century fly tying books. Twice his expertise was featured in Sports Illustrated. Once as an entomologist/collector and once as a creative salmon fly tier. However, it was not until 1993 when his first book, The Salmon Flies of Major John Popkin Trahere, was published that Schmookler’s impact on the fly tying community started to take hold. 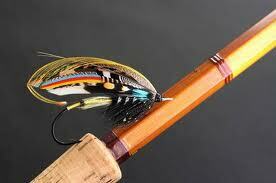 He did this by demonstrating the beauty and intricacy of classic exhibition salmon flies. In 1994 and 1997 his groundbreaking coffee table books, Rare and Unusual Fly Tying Materials: A Natural History. Volume 1 – Birds and Volume 2 – Birds & Mammals, educated fly tiers, collectors and artists about the beauty and history of fly tying and raised the standard by which future angling and fly-tying books would be judged. These books were followed by Forgotten Flies (1999). Finally, the upscale publication, Art of Angling Journal, a culmination of a lifetime of Schmookler’s interests succeeded in leaving the legacy of having raised the image of classic and creative fly tying from a mere craft to an accepted art form. Art of Angling Journal was the first and only fly tying publication to receive five Gold Ink Awards, and was recognized internationally, for outstanding design and content. Given his expertise in tying imitative and realistic flies, to a historic journey into the depths offlytying, to sharing the history of the art and craft, Paul continues to be recognized as one of themost knowledgeable and creative flytyers in the world. Joseph Humphreys is a nationally known fly fisherman, conservationist, author, and educator. He has been a fishing instructor to anyone who wants to learn the sport, including VIPs, for over 45 years. Joe has traveled the world representing the U.S. in fly fishing competitions, has guided presidents & celebrities, held the Pennsylvania state record, hosted the first national fly fishing show on ESPN, and was inducted into the Fly Fishing Hall of Fame. Joe is also a published author of numerous books and articles on the sport of fly fishing, including: Trout Tactics, Trout Tactics Revised, and On the Trout Stream. In addition to these major and well-respected works, he is a regular contributor to regional and national journals and periodicals. Along with his writing, he has also produced and starred in several highly successful videos including, “A Casting Approach to Nymphing Tactics”, “A Casting Approach to Dryfly Tactics in the Brush”, “A Casting Approach to Flyfishing to Catch Fish, Not Just to Cast”, “The Dryfly and the Top Water Game”, and the Telly Award winner for Best Video, “The Night Game”. As one of the foremost educators in angling, Joe Humphreys directed the renowned angling program at the Pennsylvania State University for nineteen years, providing introductions and foundations to young and old for a life-long enjoyment of the sport. He has lectured throughout the United States enhancing the reputation of Pennsylvania fishing. Joe’s passions also include working with local and national organizations to improve stream quality. He’s proud that his students have become the advocacy base to sustain Pennsylvania waters and believes that teaching youth to fly fish, including the U.S. Youth Fly Fishing Team, is pertinent for further protection of and respect for the environment. Joe also dedicates his time to honoring our Veterans through his support of Project Healing Waters and strongly believes in the healing properties of streams. Tom is a frequent contributor to The Atlantic Monthly, Sports Illustrated, Esquire and The New Yorker. He has also written and produced such films as The Missouri Breaks and Even Cowgirls Get the Blues. Among McGuane’s awards and recognitions are the Western Literature Association’s Lifetime Achievement Award, the Northwest Booksellers’ Award, selection as a finalist for the National Book Award, the Roderick Haig Brown Award from the Fly Fishing Federation and the Landowners’ Conservation Award from Trout Unlimited. His work 92 in the Shade was nominated for a National Book Award. In 2010, McGuane was inducted into the American Academy of Arts and Letters. Today, Tom actively helps the Tarpon & Bonefish Trust by raising funds and promoting awareness of its science-based research efforts through such television shows as Buccaneer & Bones, currently in its third season of production. In 1926, Paul Young’s rod designs would change the future of bamboo rods. He developed a unique line of shorter, lighter and thinner rods. At first, customers and the industry scoffed at these rods. They were considered novelties or toys not capable of catching large fish. Little did they realize the lasting impact Paul’s designs would have on rodmaking. Young’s designs flourished. To meet the increased demand, Paul used blacks from South Bend, E.W. Edwards and Heddon and finished them personally to his specifications. Chauncey Lively recalled, “When Paul developed his Midge rod, his most diminutive rod at 6 feet 3 inches and 1 3/4 ounces, it caused quite a stir and became a very popular model. Paul mentioned several times that a customer was using a Midge for Atlantic Salmon and he fussed and fumed about it. It worried Paul because the little rod was not intended for such heavy-duty work. The customer was Arnold Gingrich, publisher of Esquire, and a distinguished author.” A short time later, A.J. McClane, a long-time fishing editor at Field and Stream, also discovered they were indeed capable of catching large Atlantic Salmon and of course he too wrote about them. Young was more than a rod maker. His first book Making and Using the Dry Fly (1933) was revised in 1935 as Making and Using the Fly and Leader. It provided the angler with instructions on many topics, such as how to tie a fly and how to properly fish a stream. In addition to fly tying and reading the water, Young’s appraisal of the use of leaders and their construction were monumental in the development of modern day fly fishing. Being an inquisitive, thoughtful man, Young never failed to dive into the many areas of fly fishing. Given his prominence in the tackle business, his opinions held sway at all levels as evidenced by his involvement in any number of different types of hooks he helped Mustad design for fly tyers and anglers alike. Throughout his early books, Young made it clear that fly-fishing should not be all-consuming but be about More Fishing, Less Fussing, the title of his catalogs which he later used as the title of his 1940 book. As a fly tying and fly tackle retailer, Paul developed his own line of materials, hook designs, tapered formula leaders and of course bamboo fly rods that are highly treasured today. A student of Joe Brooks and a pioneer in saltwater fly-fishing, Stu Apte has held 44 saltwater records, some of which still stand. He has fished every corner of the world from Islamorada to Iceland and everywhere in between. Over the years, Stu developed many new fly patterns and was honored by having his iconic orange and red tarpon fly selected for a U.S. postage stamp. He improved knots and leaders, wrote books, was an early pioneer in filming fly fishing adventures, appeared in many fishing shows on television and is a regular contributor to various fishing magazines. Stu spent his time guiding anglers in the Lower Keys for tarpon and bonefish, as well as exploring the “Back Country” of Florida Bay and the Everglades for snook and redfish. It wasn’t long before he also headed offshore to chase and catch dolphin, wahoo, tuna and kingfish on light tackle and a fly rod. Given his experience guiding and fishing in Florida and routine frustration with the strength and durability of fishing gear, boats and engines in the harsh salt and sun environment, Stu started working closely with manufacturers to improve their saltwater performance. He brought his own real life experience to rod & reel design and was instrumental in creating better drags, finding more corrosion-resistant metals, various reel parts, rod guides and reel seats. An ardent conservationist, Stu is one of the founding members and is on the executive board of the Bonefish & Tarpon Trust. He is an advisory board member to the IGFA and an officer and trustee of the Everglades Protection Association. Stu was elected to the Fishing Hall of Fame in 1969 and the IGFA Hall of Fame in 2005. His CFFCM Hall of Fame selection recognizes all of his contributions to the sport of fly fishing. Larry Solomon, with Eric Leiser in 1977, wrote The Caddis and the Angler. This groundbreaking book proved to be the forerunner of many books on caddis flies and continues to serve as a reference on the topic. Besides covering caddis flies, the book explores new fly patterns and techniques for fishing them. Larry based much of what he learned for the book on observation of caddis flies in an aquarium in his New York City apartment. As an outgrowth of his study of caddis, Larry developed the later-to-become-popular “delta wing” concept for tying caddis imitations. This concept showed up in other anglers’ writings and has been generally incorporated into fly tying of caddis flies. Larry went on to write another book, The Complete Book of Modern Fly Fishing, published in 1979. Here he provided anglers with information on tackle, fly casting, fly tying and fly fishing in both fresh and salt water. Larry also highlighted the importance of taking care of our cold-water fisheries and encouraged anglers to support conservation organizations such as Theodore Gordon Flyfishers, Trout Unlimited and the Federation of Fly Fishers. Moreover, dozens of fledgling anglers have accompanied Larry on the stream to their lasting benefit, as they learned entomology, casting techniques, water reading and the wiles of trout from him. Countless more gratefully learned the “arts of angling” programs at TGF and other fishing shows. Larry also dedicated much of his time and effort to protecting trout fisheries. He served as an officer and then as president of Theodore Gordon Flyfishers in the late 70s. He continued to press for appropriate stream regulation. During this time, he actively participated in the fight by TGF against the Prattsville Pumped Storage Proposal by New York State Power Authority. Larry also worked with other organizations to improve water release schedules from NYC reservoirs into Catskill rivers and worked against various local threats to streams in New York State and elsewhere. Joe Brooks, the acknowledged dean of international outdoor writing, fly fished every corner of the world. He was the fishing editor of Outdoor Life magazine, featured on ABC’s American Sportsman TV series, wrote thousands of articles and authored ten books including: Trout Fishing, Saltwater Fly Fishing and The Complete Guide to Fishing Across North America. His teaching generosity was unmatched and his influence is felt by all anglers including such legendary fly fisherman as Lefty Kreh, Stu Apte and Jimmy Albright. Dozens more of today’s greatest anglers have continued to pay forward Joe’s gift of the love of fishing. Brooks suggested Lefty Kreh start writing about the outdoors for local Maryland papers, taught him to fly fish and pushed him to become the tournament director for the Miami Met Fishing Tournament. When asked what he could do to repay Joe for his kindness and counsel, Joe replied, “Lefty, just share with others what I have shared with you.” According to Lefty Kreh, “Joe Brooks was one of the best known American fly fishermen for many, many years…and my biggest influence”. Brooks was the Chairman of Fresh Water Committee of the Maryland Fish and Game Association. His interest in youth education blossomed with the founding of the youth educational organization known as The Brotherhood of the Junglecock, a group he remained active in throughout his life. Brooks believed in starting fly fishermen at a young age and with the assistance of J. Hammond Brown and Frank Burt Smoot, he developed “The Junior Outdoorsman”. It was published by the Maryland Fish and Game Association and was targeted to young boys to teach them about fishing and conservation. Considered one of the first modern saltwater fly fishing pioneers, Brooks developed the famous “Blonde” design of streamer flies that worked both in fresh and saltwater. He was one of the first to angle for bonefish with a fly and his subsequent articles helped create an entire new fishery in Florida and the Bahamas. An early advocate for light tackle angling, Joe believed strongly in using lighter leaders and tippets, especially as the technology for manufacturing synthetics was improving. Jimmy Albright said, “Joe was a traditionalist. The notion that you should over-tackle a fish was simply not in the cards.” Therefore, it is not surprising that Joe Brooks would write about the time he fished with Stu Apte off Little Torch Key when Stu caught one of his many world-record tarpon on 16-pound test tippet. Joe Brooks died of a heart attack at the age of 71, while wading in one of his favorite trout rivers, the Big Hole in Montana, but he is still connected to every fly fisher in the 21st Century and that connection will last forever. Holden’s books, together with contributions to Forest and Stream, Field and Stream, Outdoor America, Outdoor Life and the Anglers’ Club of New York bulletins, were informative yet influential. Out of George Parker Holden’s genius and angling passion would emerge many followers and admirers; among them were cane rod builder protégé Everett Garrison (1893-1976) and Catskill region fly angler and tyer Harry Darbee (1906- 1983). Both of those individuals would rise to (and perhaps surpass) Holden’s own level of fame–Garrison as one of the most talented, creative and influential rod builders who ever held bamboo in his hands and Darbee who became the Catskill trout fly tyer personified. Harry Darbee once wrotethat George Parker Holden’s Streamcraft “probably had as much influence on fly tiers and fishers as anyone else in his day. His book was the first one I owned and I almost memorized it in the early days of our commercial tying.” Darbee credited Holden as being the first person to publicize Catskill fly tying lore. Holden’s Streamcraft chapter titled “The Angler’s Flies and How to Tie Them” demonstrated step-by-step fly tying instructions using photographs in place of illustrations. Everything from setting wings to winding hackles was described in Holden’s now classic book. Holden’s inclusion in Streamcraft of William Mills & Son color fly plates that featured bass, trout and salmon flies made the book a valuable fly pattern reference guide. Dressings for many of the standard patterns were featured in the book, along with interesting historical observations surrounding the flies. Beyond discussion of fly tying, fly pattern descriptions and dressings, casting techniques and rod selection notes, Holden’s Streamcraft alsointroduced to his readers to the names of several members of the growing “Catskill School” of fly tyers. These and other regional fly fishing personalities would later become icons commonly associated with fly angling history: Theodore Gordon and his Protégées Roy Steenrod and Herm Christian along with George M.L. LaBranche and Louis Rhead. Ed Shenk is best known for his many contributions to fly fishing centered on the LeTort Creek in Carlisle, Pennsylvania. In the course of his life-long love affair with the LeTort, Ed originated and tested a number of flies, including the LeTort Cricket, the Flat Wing LeTort Hopper, the Shenk Cress Bug and the Shenk Sculpin. Ed also brings his talents to bear on cold-water conservation issues. With Jim Bashline, Ed shared the first presidency of the Cumberland Valley Chapter of Trout Unlimited. For his efforts to save and preserve our fisheries, he has received recognition, including the Limestoner Award, the Charles Fox “Rising Trout” Award, the George Harvey Award and the Order of the Hat (Harrisburg Fly Fishers). He is a dedicated writer on fly fishing. With his book, Fly Rod Trouting (1989) Ed shares the secrets of his techniques and tactics, fly patterns and the saga of “Old George,” a gargantuan trout of the LeTort. He has also published numerous articles in fly fishing and other sporting magazines. In addition, he has created a video, Ed Shenk, Master of the Le Tort (2000) describing tying and fishing five of his fly patterns. Teaching has also been a forte of Ed’s. He has served as fly fishing instructor over the years for a variety of organizations, including Allenberry Inn, Orvis and Penn. State University. Inspired in childhood by her father, John Frost, she took to the long rod. She could cast well and fish well but her frustration was that trout flies were not manufactured in the United States. Carrie soon found herself experimenting with various materials obtained from local birds and fur-bearers. After tying many types of flies, suited at first to please only her father, others came to her door asking for her fur and feather creations. Carrie Frost expected to enter the teaching profession but her true passion in life was fishing and so she abandoned the classroom and followed her dreams. Demand led to the establishment of her tackle company, at first employing the household maid and neighborhood girls to assist with fly tying. The demand for Frost flies grew so rapidly that by 1917 the number grew to 150 employees. In only a decade after the establishment of her company, Stevens was annually selling 4.5 million flies and other pieces of tackle. The enormous success of the C.J. Frost Fishing Tackle Company led to national sales through well-respected establishments, such as Montgomery Ward and others. Her slogan “Fish Fight for Frost Flies,” was known throughout the country. A local business group purchased the company, eventually changing its name to Weber Life Lifelike Fly—the slogan was changed to “If Weber Makes it, Fish Takes it.” Weber eventually became the Weber Tackle Co.
Roderick Haig-Brown (1908-1976) was an English-born, naturalist, fly fisher, author, philosopher, magistrate, educator and ardent conservationist. He spent most of his adult life in British Columbia fishing for trout, salmon and steelhead. Blessed with a graceful pen, he put words to deeds and actions that the non-angler could not only understand, but also truly appreciate. He penned almost 30 books, including such noted works as A River Never Sleeps and the remarkable book series: Fisherman’s Spring, Summer, Fall and Winter and wrote innumerable essays and articles for outdoor magazines and journals. He pioneered a fundamental environmental awareness and appreciation for the beauty and wildlife of the Pacific Northwest amongst the populace of B.C., which ultimately helped to preserve the precious resources in the Campbell River watershed, the Adams’ River steelhead runs and king salmon in the Nimpkish River. In 1971, this dynamic duo turned the fly fishing world on its collective hare’s ear by marrying the science of entomology with fly-tying in the book Selective Trout. In it, they introduced a radical new concept to dry fly fishing, the no-hackle dry fly, giving picky trout an imitation fly with a more convincing, natural silhouette; and anglers a new arsenal of deadly fly patterns. Championed by Joe Brooks in Outdoor Life and drawing upon the works of such legends as Flick, Schwiebert and Marinaro, these two gentlemen went allover the eastern and western US trout streams collecting bugs, taking pictures, classifying their findings and then developing entirely new types of life-like trout flies. Under the critical eye of the editor, Nick Lyons, they produced for Crown Publishing the largest selling fly fishing book at 200,000+ copies. They went on to write well received follow-up books like: Fly Fishing Strategy, Stoneflies and Emergers. Pennsylvania natives Barry and Cathy Beck are the husband and wife photojournalist team that exemplifies the best of the old and the new world of fly fishing. From their simple roots running a fly shop on the small freestone Fishing Creek near Benton, PA and fishing with the likes of Vince Marinaro on Falling Spring Run they have since traveled the world together, hosting adventure-travel fly fishing expeditions and teaching modern fly casting techniques. They continue to take breath-taking angling pictures that change the way we view the fly fishing world with their photographs. The Becks have scored hundreds of print magazine covers and articles, fishing catalogs, websites and are now populating the exploding new world of Internet virtual fly fishing e-zines. They have authored numerous books, including The Blue Ribbon Guide to PA Trout Streams, Seasons on the Bighorn and the Outdoor Photographers’ Handbook. John Alden Knight (1890-1966) was a banker, syndicated writer, fly-tier, hunter, naturalist, casting expert, angling filmmaker and developer of the Solunar Tables. His greatest legacy was methodically codifying the rhythmic effects of the sun and moon phases on fish (and game) into peaks and troughs by longitude and latitude in his Solunar Tables developed in 1926 and published in 1936 to immediate acclaim (and some scoffing). In addition to several noted hunting books, he is also remembered for his books The Theory and Technique of Fresh Water Angling, The Complete Book of Fly Casting and Modern Fly Casting.